Elk Grove's East Franklin neighborhood. As suburban cities go, Elk Grove is a fairly large one with neighborhoods spread out over a wide-area. Most of us tend not to visit neighborhoods other than our own without a specific purpose. Unless they are visiting friends or family, an Elk Grove resident living in Sheldon will probably not wander over to the parks or small shops in East Franklin, much less drive through the neighborhoods. That same East Franklin resident may drive through Sheldon if they are going to work in Rancho Cordova, but probably will not stop on their way home for a take-out pizza from Fat Mike's or turn on Rubio Drive, unless they were using it as a shortcut. Which brings us to a story posted here several days ago about a man who was held up in front of his house on Tittle Way in Elk Grove's far southwestern neighborhood of East Franklin. One of the 12 comments posted on the story said, "Sadly, that whole neighborhood has gone to hell. We all saw it coming; broken windows not being repaired, cars parked on front lawns, garbage piles in front yards, weeds 3' tall, etc. It will take decades of gentrification before it becomes inhabitable." The comments reminded of us the three-part series East Franklin Blues posted on EGN over seven years ago about the effects of the housing collapse on the East Franklin neighborhood. 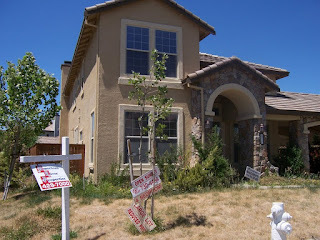 Home buyers in those subdivisions had the unfortunate timing to buy just as the market was peaking in the housing boom and were among the first in Elk Grove to feel the effects of the housing collapse of the Great Recession in 2008. 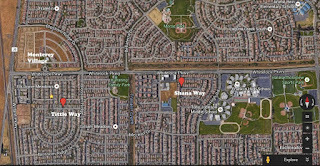 One street profiled in that series was Shana Way, which is about a half-mile geographically away from Tittle Way. 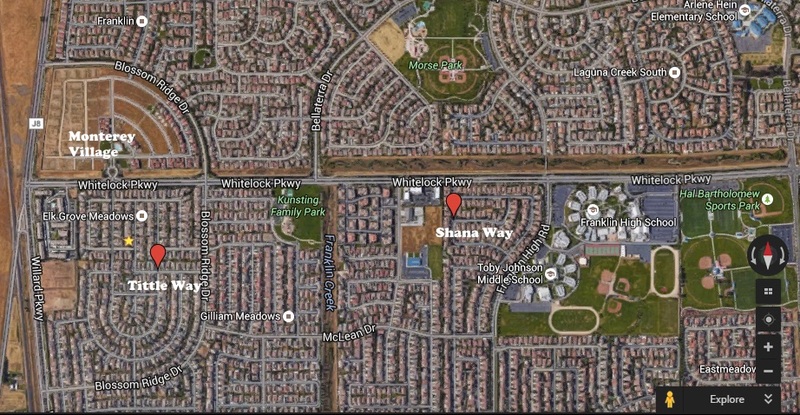 At the time, numerous houses on Shana Way were for sale and headed toward foreclosure. Although it is hard to tell the true condition of Shana Way given the effects the drought has on lawns, the street appears to have stabilized in terms of houses abandoned housing in the immediate aftermath of the housing collapse. Prior to New York hedge funds' large scale cash purchases of homes in Elk Grove for rentals, the East Franklin neighborhood was a favored spot for youth in Elk Grove to hold so-called abando parties. Like Shana Way, a visit to Tittle Way found all the lawns golden, so it was hard to determine the true status of the street. Although we did not see any broken windows or garbage piles as noted above, there was one house with very tall weeds and one driveway with a car on blocks. 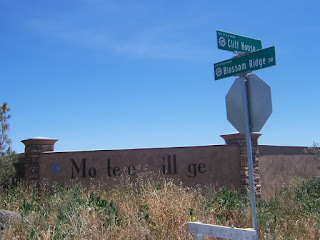 The north entrance to Monterrey Village in June, 2008. A visit to the nearby gated community of Monterey Village (see our May 2008 story on this subdivision), which was a precursor to the housing crisis with its 2007 collapse, visually revealed similar results. In 2008 EGN documented the gated community where construction tools had been abandoned, condominium construction unfinished, non-functioning security gates (perhaps the HOA collapsed too) and the use of the community as a dump. Today, the security gates are in use, a functioning homeowners association seems to be in place, the unfinished construction completed and the neighborhood is no longer a dumping ground for unwanted furniture. Unfortunately, construction has not resumed in the gated community, and there is no evidence of any progress to build it out (See before and after video of of Monterrey Village below). While the above-noted neighborhoods, as well as many others in Elk Grove, face on-going challenges, to be certain the city's newest areas south of Elk Grove Boulevard has rebounded since the 2008 collapse. New homes in previously approved subdivisions are under construction, and some of the unused new retail space is slowly gaining occupants, even if they are churches. Love them or loath them, the area is also home to a new Walmart store, and possibly the only McDonald's in the world without outdoor trash receptacles. And yet, even though there are several unfinished subdivisions and challenged neighborhoods throughout the city, there are rumblings being heard from residential developers and the Elk Grove City Council about their mutual desire to once again pursue expansion of the city. This time thought it is being done with the veneer of economic development. Next week the city will be holding its second annual neighborhood summit. To those who might attend the meeting, beforehand why not closely look around your neighborhood, and more importantly, other parts of town you might not normally visit and take note of the good, bad and ugly. Take notes, take pictures and arm yourself with both the positive and negative information you unearth and share it with your fellow citizens, the Elk Grove city staff, and the Elk Grove City Council. Furthermore, keep in mind the city's financial health, stability, safety, and road maintenance affect our neighborhoods and ultimately the value of our homes. Long after the developers who fund all our council members with their generous cash donations leave town with carpetbags of booty and city council members slouch their way to some other political office, we the residents who fund this city will be left with the positive and negative consequences of their actions. Demand our executive city staff, most of whom can't even be bothered to live in Elk Grove, and elected officials that before they eye expansion of our city for the benefit of their moneyed housing developer patrons, that ALL neighborhoods have properly maintained roads, are built-out, safe, stable and the city is on sound financial footing. In the words of Elk Grove Mayor Gary Davis, let's throw it back to the city council and mayor and make sure, no demand, stronger neighborhoods isn't just another throwaway campaign slogan. I trust our leaders care about strong neighborhoods, and that is why I am so excited about the soccer fields and aquatic center coming. You see, once EG becomes a destination city, our neighborhoods will become hot commodities as we convert into Bed and Breakfast's or earn a little money on the side by renting a room through AirBnB. Be patient my friends, you will see! Can you believe it...Iran is even ahead of us in the AirBnB business. It's time to speed up that "Destination City" image so I can get some $$$ flowing through this household. They/Iran did say "Tourists from the US, are required to have tour guides during their stay in Iran". So we'll need tour guides too..that's where those high-paying jobs come into being, right? I only care about my little neighborhood by EG Park. We're an older neighborhood experiencing heavy turnover from the old timers to new buyers. Our homes don't have all the bells and whistles of new, so upper to middle class buyers largely look elsewhere. What I fear are new buyers in an elevated market (again) not having resources for repairs or overcoming job disruption in event of a down economy. Its the cycle of older neighborhoods in far flung suburbs without jobs. The good news is that our homes have good bones, large yards, and the Park. Beats Frankguna any day. But Elk Grove is going to a flying heap of crap in a generation. Certainly not a ghetto in the historical sense of the word, but we have our issues. The corridor bounded by Franklin on the west and Big Horn on the east, Sheldon on the north and Bilby on the south is one of the least desirable areas of the city. Too many apartments. Too much crime. You couldn't pay me to live in that area. We lived there for 10 years, but a little east of Big Horn, which was better, but we saw the signs and knew it was time to head east of 99. It's too bad but Bruceville and Franklin Blvd, not to mention I-5 are easy access from the south Sac area. East of 99 isn't as bad, even in South Sac. Elk Grove is starting to look like a steaming dumpster fire of a suburban ghetto in the making. Look at the more established neighborhoods. Can anyone say "Mack Road" or "Power Inn Road? two steaming suburban dumpster piles of starter homes. We don't need more subdivisions filled with cheaply built tract homes sited on postage stamp sized lots. WE NEED BUSINESS PARKS and good paying jobs. Not more retail and fast food jobs. Less water for current residents during a horrendous drought. More fast food joints and strip centers. Might as well become the sister city of some city in Pakistan.